Stop Stressful Problem Behaviors and Transform Your Jack Russell into a Model Pet... All for Less Than $15! "Yes, I'm ready to buy!" I wrote The Jack Russell Lover's Ultimate Guide to Training after coming up against frustration time and time again as a Jack Russell Terrier (JRT) owner. I finally hit the point where I couldn't take it anymore, so I researched dog training and experimented with various techniques until I came up with solutions perfectly suited to training Jack Russells. That's how this book was born. 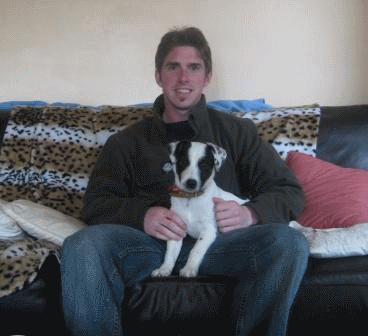 That's me with my dog Runty, back in the days when I worked at a wildlife park. 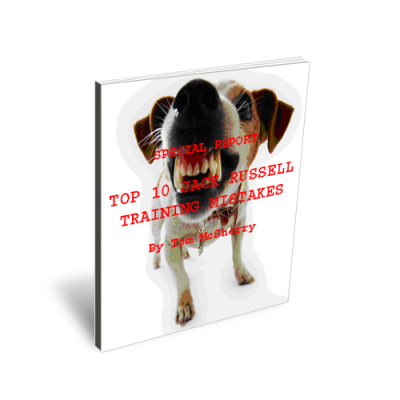 Unlike virtually everyone else selling a "Jack Russell specific" training ebook, I really do own and train Jack Russells. I won't bore you with all the details. I'll just tell you exactly what you get when you buy this ebook. As a puppy owner, there's no reason to let problem behaviors develop (as they ALWAYS do with Jack Russells, unless you take action). And if you're already fed up and stressed out with your Jack's bad behavior, there's no reason to put up with it anymore. "In my opinion the way this book is written is in a simplistic way so that an individual with limited experience in training dogs can understand it. Yet for someone like myself with experience in training dogs, specifically Terriers, found the information interesting enough to continue reading it. I feel that every Jack Russell Terrier owner can gain something from reading your book. It is the perfect book for first time Jack Russell Terrier owners." - Robbin Grabowski, operator of a Jack Russell Rescue centre with over 10 years experience in training and caring for dogs, whose rescued dogs have won various titles in Flyball competitions. "The Perfect Book For Any New JRT Owner..."
"What a great book about Jack Russells!!!!!! Everything's so true about those little devils, and this is definitely a good start to learn to understand them. The "9 Essential Principles" is a very good summary to dog training, with detailed explanations of each principle to follow. The checklist at the end of each chapter is also very helpful. It checks to make sure you've really read the information, not just skimming through it. Other than training methods, this book also focuses on what the dog is thinking and creating "win-win" situations, because we all know there's no way to make a JRT do anything it doesn't want to!!! It's a perfect book for any new JRT owner, or anyone who just wants to know more about them." - Habie Ng, Jack Russell Terrier owner. "The Best Guide to Train JRs..."
"I want to tell you that I have found your book the best in its kind. It is written in such a simple language, it is a pleasure to read it. Besides, many pages has made me smile. It is like if you were talking about my Yago! I love it. However, I must confess, my children and I have made many mistakes, so, we are trying to correct them following your book. As you said, sounds simple, but sometimes it simply doesn't work that way. My Yago has such a cute face that sometimes we find it hard not to spoil him. My children are also reading the book because everybody has to be involved. I have encouraged them to read it, and finally they are doing it, and they are enjoying it so far! I want to thank you for making such a deep study on Jack Russells. All the things you say in your book are so true! The characteristics of the breed, how they are hunters, everything! They are great dogs! And your book is the best guide to train JRs. I am glad I found you on the web." - Martha Del Mazo, Jack Russell Terrier owner. "Hi, just wanted to let you know what I thought of your book. In a word "brilliant." I found it easy to understand and to put in to practice. Most of it worked, I haven't finished the training yet as it's always ongoing, my Nell is only 8 months old but I can see an improvement having used this book. I recommend it to any first time terrier owner, it is both interesting and useful. Many thanks Tom. Let me know if you write any more books." - Joy Renwick, Jack Russell Terrier Owner. I don't know how to start this. I have a Jack I love beyond reason. He is everything you have described on your site and in your book. I got him at almost 4 months old, so there wasn't a lot of basic early training, plus he came with some character quirks that had/have me at a loss on how to cope with on a daily basis. I had everyone AND their brother telling me to give him up, giving me names of trainers, giving 'How To... books. NOTHING worked. I kept saying there has to be a way, I can tell you I wanted to take 'Caesar' and whisper something up his nose. LOL. We were thrown out of puppy class. I kid you not. I had a trainer come to the house, all general instructions,nothing specific to the Jack. I was sure he did not fall into the general taining format. So I persisted and by touching on some of the things you mention (not knowing I was on the right track) and with lots of tolerance and persistence we got through the terrible 2's. But still 'issues'. He went through 3 couches!! I have pictures to prove it. Let me start at the beginning. When I went to the airport to pick him up (his name is Spencer) I could hear screaming all the way across the airport tarmac. He was in fact SCREAMING. Not barking or howling or yipping, but this high-pitched scream. This proved to be his signature for anything and everything he feared or wanted to go after. When I got outside the terminal I opened the cage to let him pee and stretch his little legs. He was running around on the end of his leash screaming and very frantic. I felt so sorry for him. He had literally exploded into my life. He was also exhausted from the trip. He cuddled on my lap as we drove home. We tried puppy school. As I said we were 'asked to leave' he would not stop screaming, No one could hear the instructor and when they tried to show me how to stop him, they failed. :-) Everyone I know kept telling me to crate him or worse, get rid of him. I did try the crate but he would not go into the same room as the crate and if I put him in the room and prevented him from leaving he would not go anywhere near the side of the room where cage sat. Nothing would convince him to go near it, nothing would entice him even close to it. After months of having this thing sit empty and his stressing over it, I gave it away. He did not take more than a few days to house break. He is very smart and very very funny. Not to mention he is so damn cute. He gives me much joy. But he still has the screaming issue. I think I read every training book out there, like you, nothing touched what I was dealing with... then I read your opening words on the web link I had followed. I stumbled onto your site by accident through a link from another page (can't remember which one) before I had finished reading that first page I knew I had found the source that was going to help me make my boy the dog 'I know is living inside him...' You confirmed my belief, Jacks are a whole different ball of wax...it was such a relief to read your words. We have started and believe it or not in a day we have a very different relationship and he has 'calmed down'. (Still screams though, we haven't addressed that yet) I 'get' what I knew somewhere in the depths of my being but could not tap into. I cannot thank you enough for taking the time to put what you learned and your love of the breed out there for the rest of us. I will keep you posted on how we make out over the next few months. Spencer is 4 and half now, we are attached at the hip and I cannot remember what life was like without him. He is a rough coat Jack. I don't pull his hair, so unless you know the breed, at first sight you would not realize he is a Jack, but once you spend time around him, there is no mistaking his Jackness. LOL." - Elizabeth McNamara, Jack Russell Terrier owner. I swear by my book and the techniques inside it. I'm so confident this will cover all the bases as you train your Jack Russell, I provide a 60 day money back guarantee with every copy. You can try it for 59 days and if you don't see results, return it on Day 60 or any time before then for a full refund. And you get to keep the ebook. So take the next step, for you and your Jack Russell, and purchase your copy of The Jack Russell Lover's Ultimate Guide to Training today. P.S. Do you have any questions about the Jack Russell book? Please don't hesitate to Contact Me and ask.